Commercial and industrial air movers are essential pieces of equipment used in property restoration, mold remediation, and many other applications. 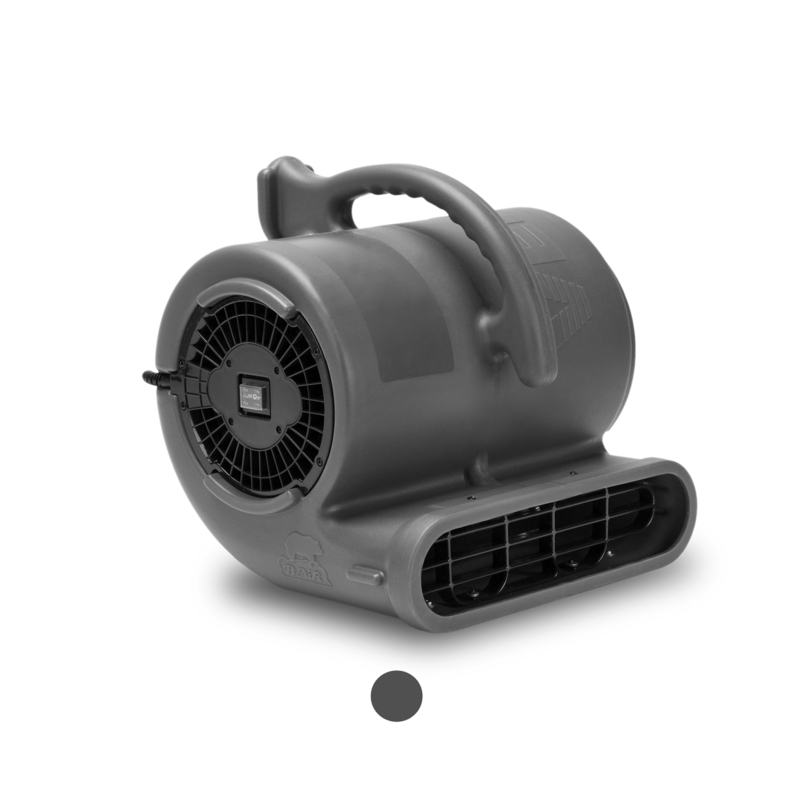 Air movers are also commonly referred to as air blowers and blower fans. At B-Air, we have 20 years of experience engineering and designing high-quality, durable air movers that will be a valuable investment for you and your business for years to come. You may make a larger initial investment when you purchase commercial air movers intended for industrial applications instead of a cheaper, lower quality fan; however, the reliability and longevity of this commercial-grade equipment will be well worth the initial purchase price. In paying a little more up front you save in the long run on having to constantly replace or repair lower-grade equipment that isn’t meant to be used day in and day out. 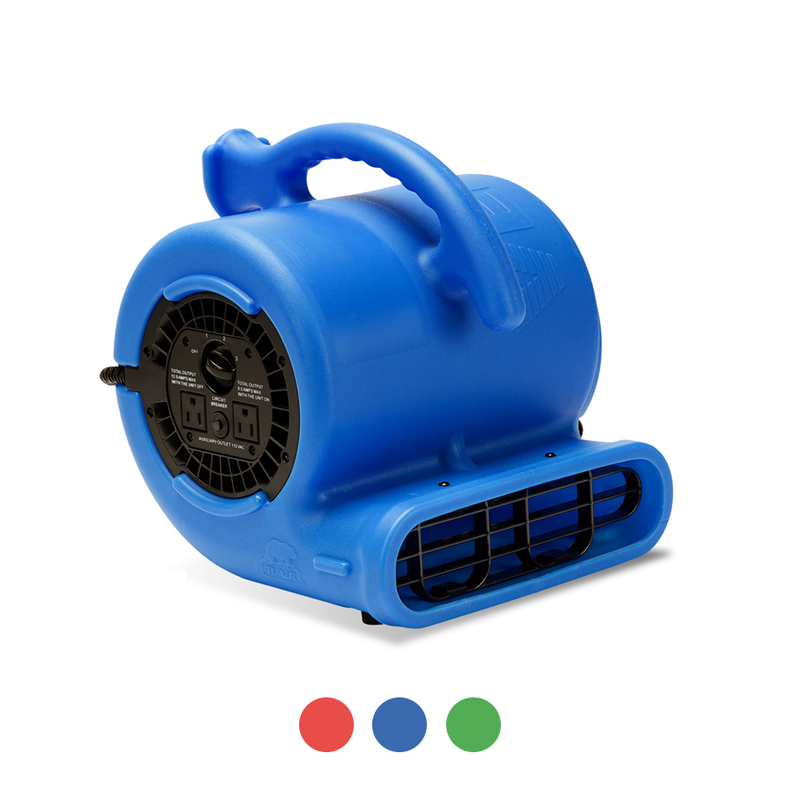 What Are Air Movers Used For? Even though air movers are a critical piece of equipment for many capacities, a lot of people don’t know the full range of roles air movers offer. Even those who use air movers on a regular basis in their work sites aren’t always aware of air movers’ other capabilities. When used properly air movers can help improve efficiency on the job site, make your work easier and saving time. 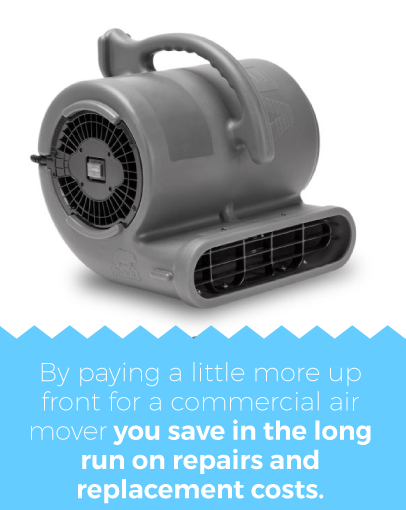 When most people think of air movers, they probably think of increasing air circulation. This is the same principle as turning on a ceiling fan on a hot or humid day — you want to get the air moving. Commercial air movers do this, but on a different scale. 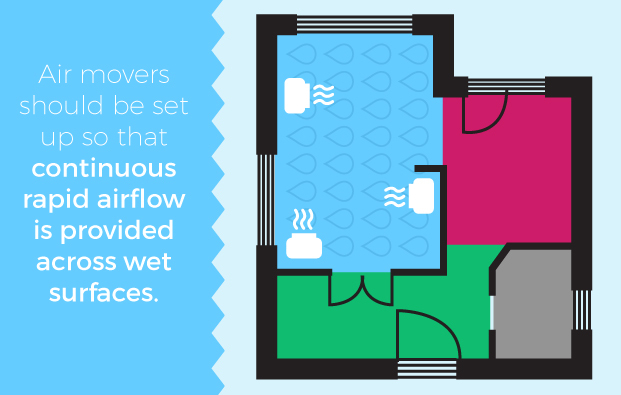 Air movers, or blowers, circulate airflow in a room. This increases ventilation, which is especially important when working around fumes or smoke. 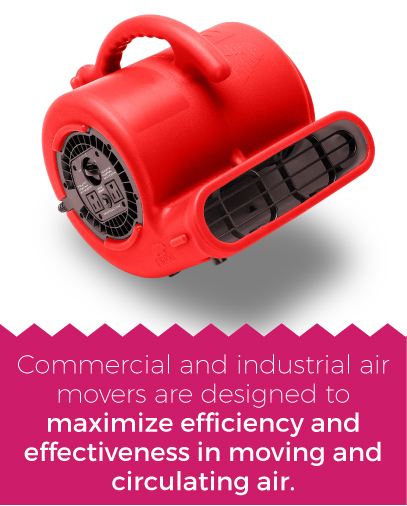 Commercial and industrial air movers are designed to maximize efficiency and effectiveness in moving and circulating air, while being designed for frequent and long-term use. Another important use of air movers at a water damage restoration work site is drying wet surfaces. Whether the area is wet due to cleaning or damage from a burst pipe, flood, or other water source it is critical to dry the affected area quickly. Drying the area quickly is essential to prevent more long-term damage and the growth of mold. 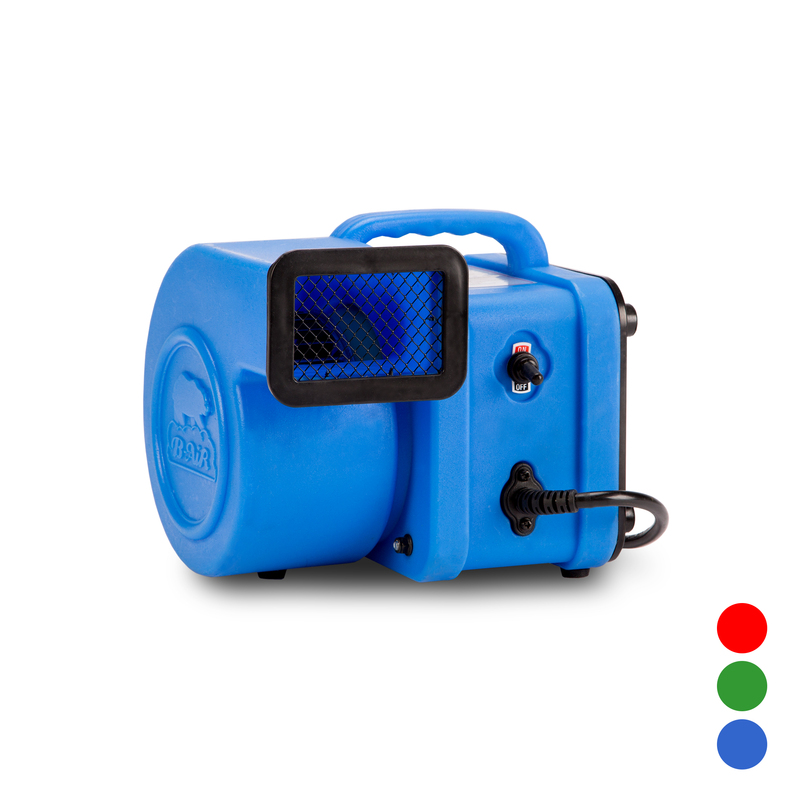 Air movers are critical to the process of removing water from the air. The air movers circulate the air containing the moisture; as moisture becomes airborne, it allows for greater rates of evaporation when used with a commercial dehumidifier. Air movers are most effective in this role around the edges of the room or affected area with the dehumidifiers in the center. See our resources for best practices when placing your equipment. These professionals rely on air movers to make their projects more successful, more efficient, and in some cases safer. B-Air® offers a variety of different models to suit the needs of all these professionals. 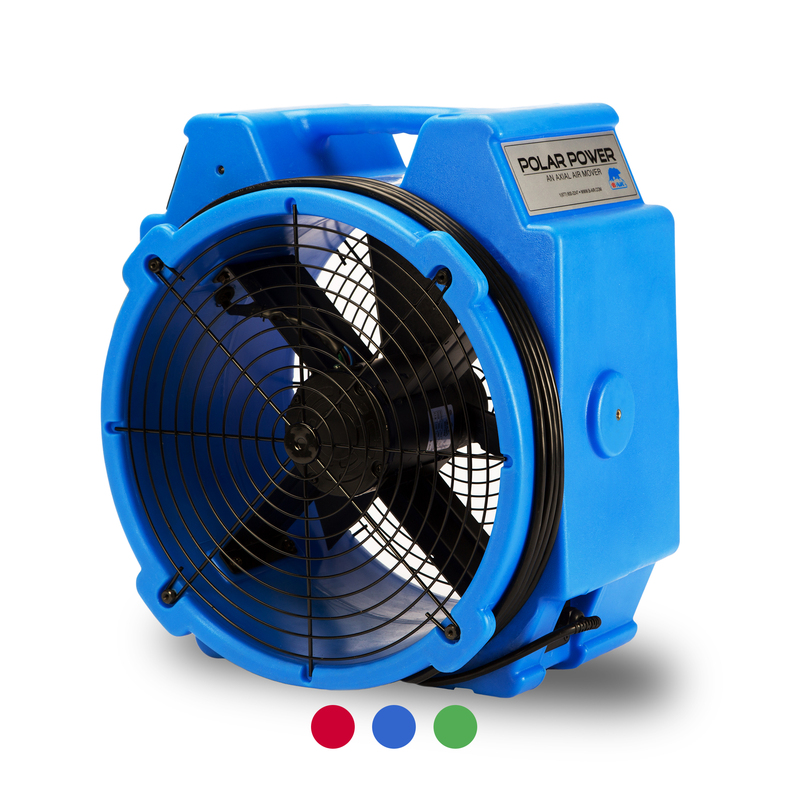 Water damage restoration professionals, in particular, often rely on a variety of different air movers. From small basements to large industrial warehouses, water damage restoration professionals need the right air movers to restore buildings that have been damaged by burst pipes, flooding, or other natural disaster. A compact and lightweight air mover, the B-Air® Flex-1 Mini is perfect for drying tight areas like underneath counters and inside closets and attics. The B-Air® PB-25 axial air mover is a powerful unit with a 1/4 HP motor used to move larger volumes of air at a lower pressure than the centrifugal models. As a lightweight and easy to move compact air mover, the B-Air® Vent VP-25 Compact Unit is perfect for closets, cabinets and other small spaces. For a balance of power, convenience, and versatility choose the B-Air® Vent VP-33 air mover. 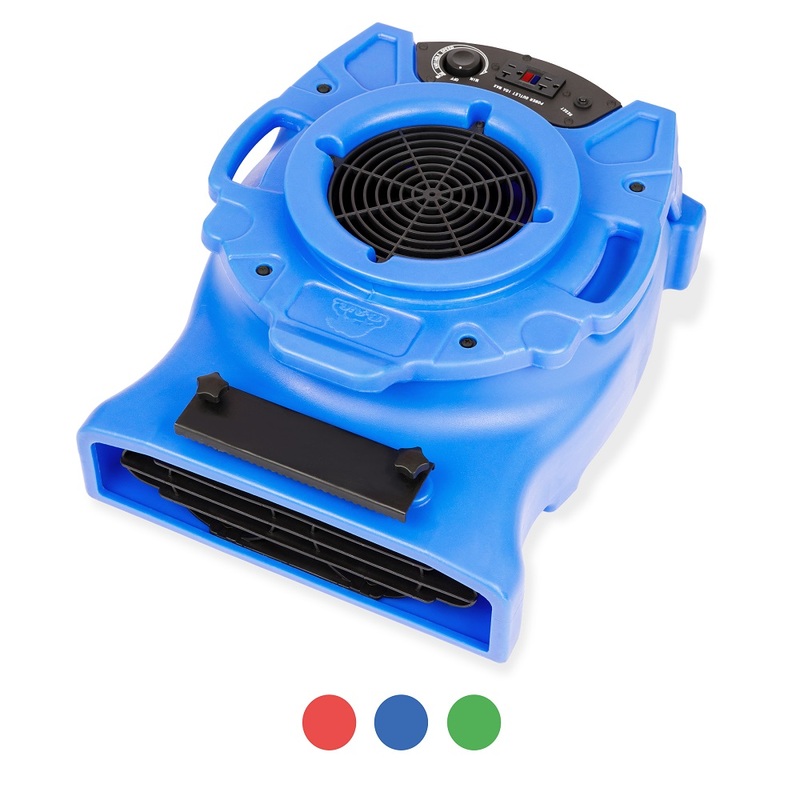 The B-Air® Vent VP-50 is a slightly more powerful centrifugal air mover. Though lightweight and compact, it’s designed to tackle large water damage restoration projects effectively. This commercial air mover is a powerful unit favored by many janitorial professionals because of its high-powered motor and variable speeds. 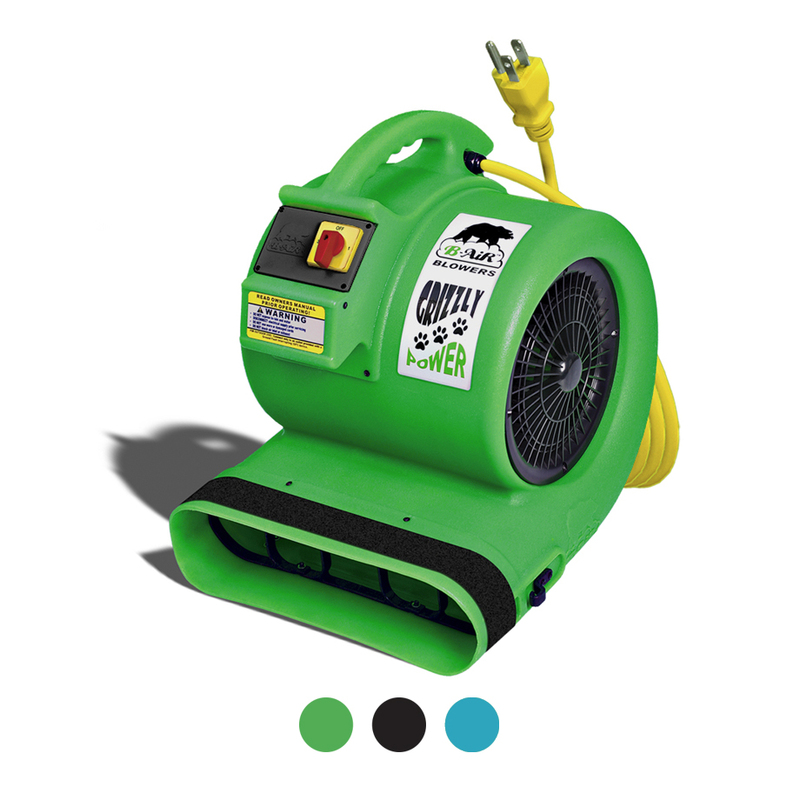 Custom colors and private labels are available with all our air movers. Contact us for information or for help selecting the right air mover for your needs. 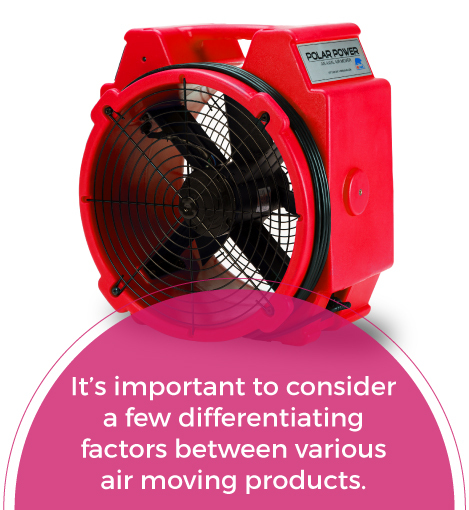 Before you use any air mover for your situation, it’s important to consider a few differentiating factors between various air moving products. These primary factors are size, type, motor size and speed, airflow, and amp draw. Size and Portability: The size air mover you want will depend on the size of the space you are drying and the man power you have available to move equipment. For more confined spaces, such as a closet or crawl space, you will probably want a smaller, more compact model like the B-Air® Flex FX-1 Mini. If confined spaces are not an issue, you may want a larger, more powerful air mover like the B-Air® Grizzly GP-1 for maximum drying power. Motor Size, Speed & Airflow: Industrial air movers or floor blowers usually come in varying motors from 1/4 horsepower to 1 horsepower (HP). 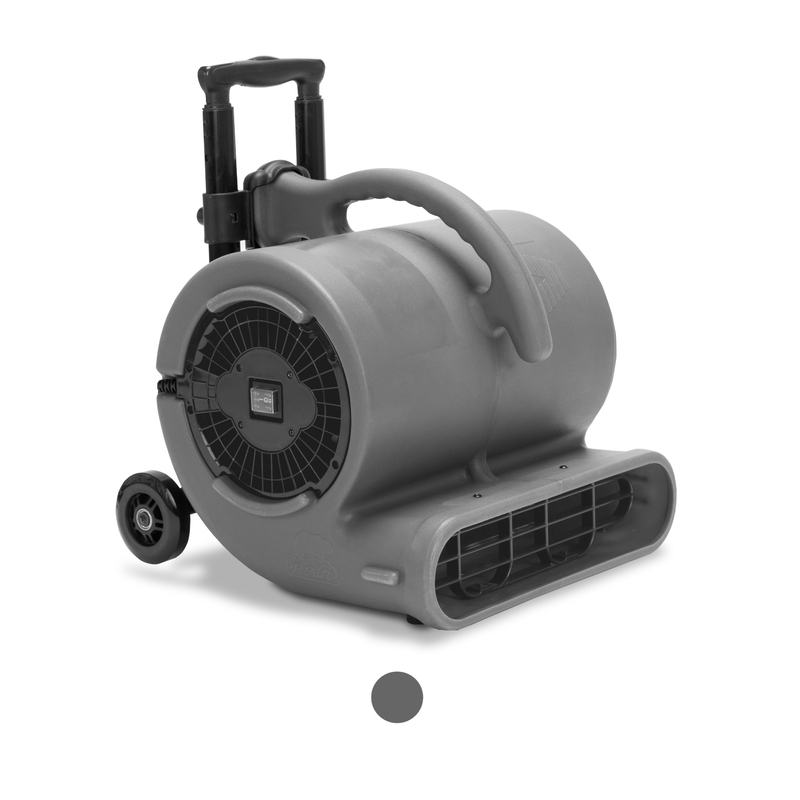 If you are only drying a small area or one that is not as saturated with water, a ¼ horsepower air mover may be perfect, for larger restoration jobs you may want one of the larger 1 horsepower models. It is also important to note there is a tradeoff when it comes to choosing your air mover motor size. High HP motors offer high airflow, but they may be noisier compared to lower HP motors. Amp Draw: All certified electrical equipment is limited to how many amps (current) it can allow. For projects that require multiple air movers to be daisy chained or stacked together, it is important to consider power draw limitations. Some buildings may be have limitations, and you may blow a fuse if you exceed them. Having a variety of air movers in your equipment fleet can be useful for this reason, and if you have an idea of where the air mover will be used check and see what is the max amount of power that you can draw without causing issues. Types of Air Movers: There are two primary types of air movers, centrifugal and axial. It is important to consider the capabilities of these types of air movers when deciding on the best commercial air mover for your needs. Axial Air Movers: Axial air movers are similar to small windmills, blades move around an axis and the air is pushed out of the fan in this direction. These types of fans are great for creating large volumes of air and are highly energy efficient; however, the air volume that they provide is very low pressure, meaning it may not be very effective in providing concentrated airflow for drying more saturated areas. Centrifugal Air Movers: Centrifugal air movers enhance the incoming air by the use of a fan wheel. The air is passed through a series of tubes and ducts before being pushed out of the opening as a concentrated force of air. 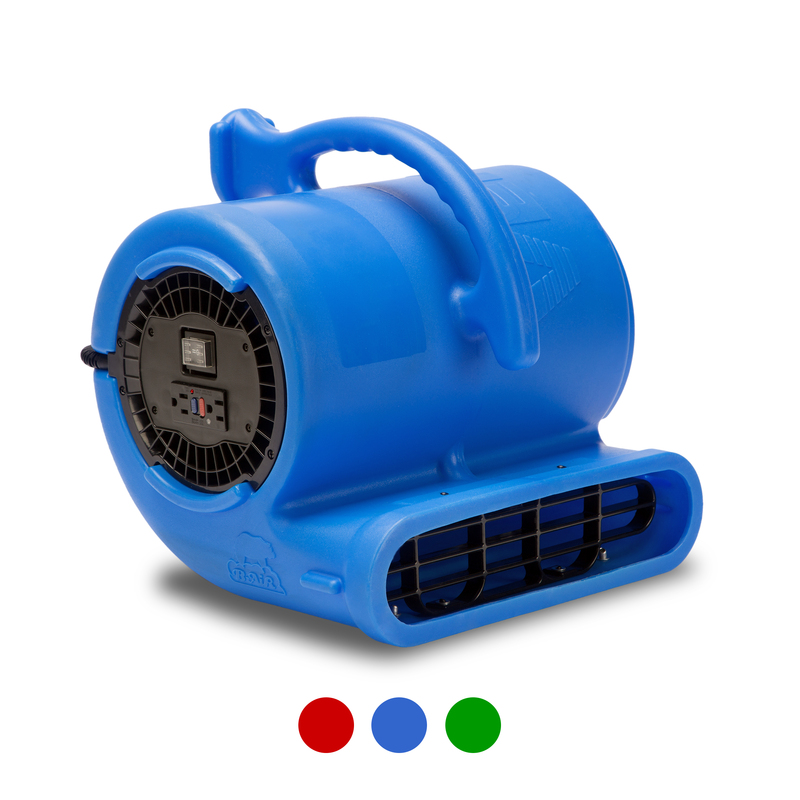 These types of air movers provide a much more pressurized airflow, but can be slightly noisier than axial air fans and tend to require more power. Best practices may vary based on job requirements and things like levels of saturation, materials, and other factors, however, here are some general best practices for using your air movers for a water damage restoration job. Typically you will need 4-5 air movers to circulate air for every one dehumidifier that you are using to ensure that all the air in the affected space is being circulated so that the dehumidifiers remove the moisture from the air. The number of dehumidifiers that you need is generally based on the size of the room. Where Should You Place Your Air Movers? Restoration air movers should be placed so that continuous, rapid airflow is pushed across all wet surfaces. They should be placed at even intervals around the room at least six inches away from walls or other structures such as stair cases or posts, and aimed so that air will move in a circular motion around the room. How Many Air Movers Can I Connect Together? 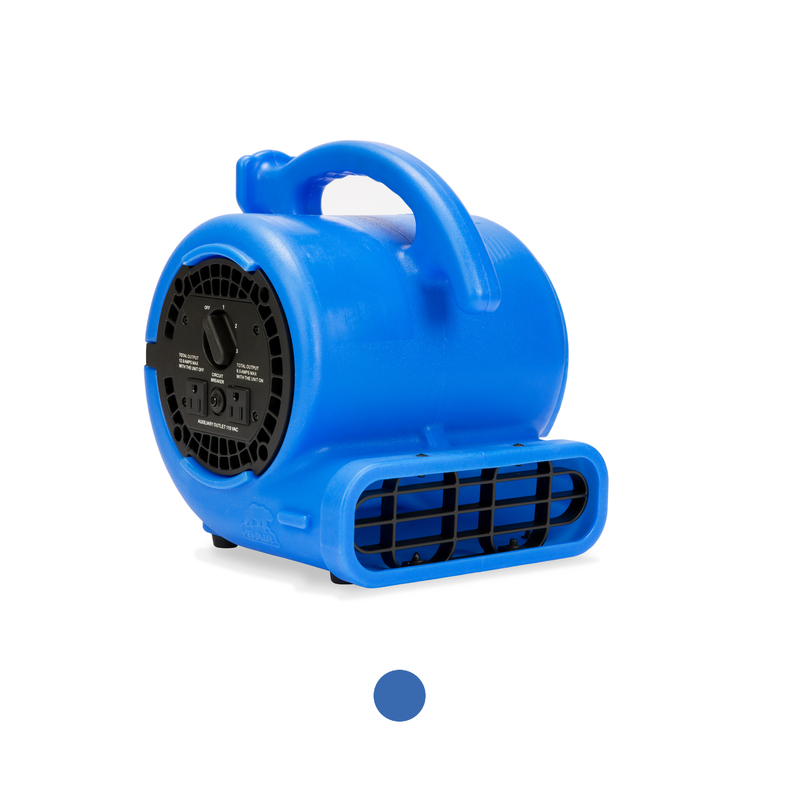 This will depend on the air mover model, but for most of the air movers that B-Air sells that do have this capability you can connect up to five air movers. All B-Air® air movers are designed to be durable enough to withstand repeated exposure to moisture in tough industrial settings. B-Air® provides wholesale commercial air movers for sale and is proud to supply water damage restoration equipment, carpet cleaning and other professionals across several industries with the equipment they need. We also offer bulk buying options for added value to professionals investing in larger quantities of equipment for their business. All of our equipment is ETL certified and CE approved for use in the United States, Canada, Europe and South America. This means that all our air movers, dehumidifiers, scrubbers, and blowers meet or exceed a rigorous set of safety standards. With over 20 years in business, B-Air® has the expertise and experience you can trust to provide long-lasting and high-quality air moving and drying equipment. When you invest in our air mover products, you are investing in two decades of engineering and design innovation that will benefit your business for years to come. Questions? Contact one of our knowledgeable sales reps online or by calling 877.800.2247.